[D]oubtless by now, you’ve all seen the picture with the caption, “Illinois District’s Newest Chapter” on the homepage of the District website. That newest chapter is made up of two of the District’s oldest Chapters, Joliet (1945 and 1955) and South Cook (1948), now merged into a single Will-Cook Chapter. To me, the process was surprisingly easy, but lengthy. Both chapters recognized they had been suffering a decline in membership/attendance for some time and that the remaining members, although proud, weren’t what they used to be. The handwriting seemed to be on the wall; for both chapters extinction was a real possibility in just a few short years. The first hint of a merger came in late 2009 when Joliet Director Bill Kerschbaum, who had visited South Cook as a substitute Director, brought a friendly word from some South Cook members about “getting together.” Several joint rehearsals were held; everyone seemed to like each other, and members of both chapters suddenly were singing with a viable chorus again. But wait. Merger is a tricky thing, and we wanted to get it right. We needed advice, so we contacted our chapter friend Bob (barbershop-everything) Squires to join us at a joint rehearsal to answer some of our more pressing questions. Not only did Bob show up but so did District President Mike Bagby and District Treasurer Dave Cowin who lent their support and council, which continues to this day. South Cook President Lou Gonzalez and I (then President of Joliet) recognized a go-slow strategy was a must: the men of both chapters needed to get to know each other, we needed to redirect our loyalties, let petty attitudes go, form new bonds (If this sounds like a marriage, it is, but even more difficult, for the rewards are more mental than physical.) Besides, we needed to understand and follow the procedures laid down in the International bylaws. 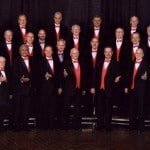 We stayed in this mode for over a year, alternately rehearsing at Joliet one week and at South Cook the next, joining with the other chorus at performances and retaining our individual identities (being announced as the Black Hawk Chorus or the Singing Men of Note, as the case might be). 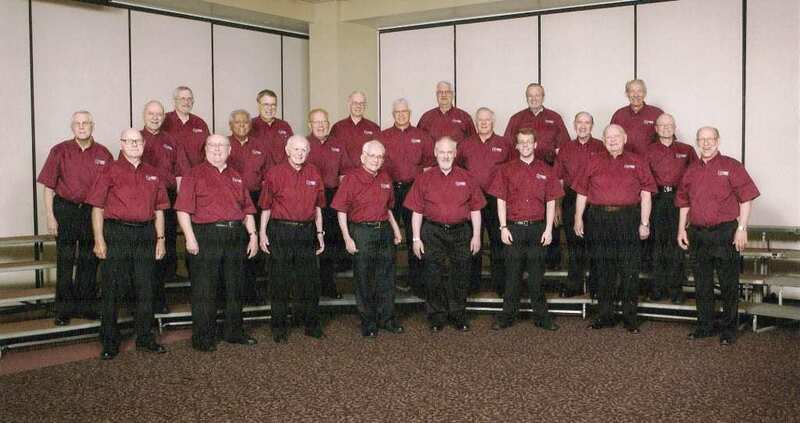 Eventually, men of both chapters became dual members of the other and even competed in the Illinois District Chorus contest as the Joliet Chorus (we could have gone as the South Cook Chorus but the Joliet Secretary submitted the contest application first), winning the small chorus plateau award. But what about the nitty-gritty? A Chapter Charter and a Chorus name seem to evoke some mysterious loyalty by barbershoppers. We needed to start anew. Heeding the advice of Dave Cowin, we decided to retain one Charter rather than chartering a new group. Joliet volunteered to dissolve their Charter and roll its membership into South Cook’s; subsequently, South Cook agreed to alter their Charter to reflect a new Chapter name. 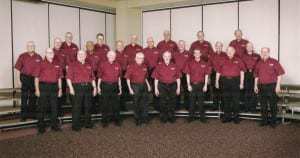 We also agreed, in the name of unity, that both chorus names needed to go; the joint Chapter Board suggested several new chapter and chorus names to the membership and “Will-Cook Chapter” (to supplant South Cook on the Charter) and “Knights of Harmony” were chosen; “Black Hawk Chorus” and “Singing Men of Note” were history. We still have several steps to go, but they seem pro forma. We received approval from the Illinois District Executive Committee to move forward, elected new chapter officers and, as this is written, are awaiting approval from International. Once this is done and some governmental documents are filed, we will combine chapter assets and formally become one chapter and one chorus. Did we lose members in the process? Maybe. Was there a clash of personalities? Perhaps (nobody actually said). Are we better? Yes. Will we need continued encouragement and advice? Yes. Will the Knights compete at the same level as the “big boys”? Not yet, but that was never our goal.